In hindsight it is strange to read a John le Carré novel where George Smiley is taken out of the espionage circles he normally inhabits and plunged into a different sort of environment. 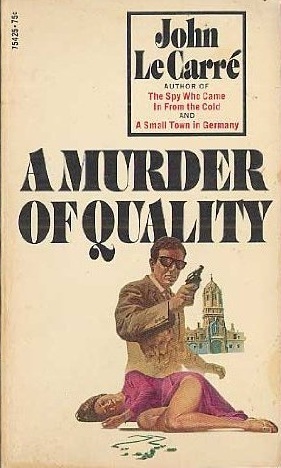 But this was only the second book to feature Smiley and perhaps le Carré didn't know where things would go. But reading this over fifty years after its publication fans do not need to fear, it's a classic Smiley story and well worth picking up. There are two networks that make this story work. One of them is the group of individuals Smiley knows from his work during World War Two. It is because of this that Ailsa Brimley contacts him. She edits a small circulation Christian newspaper and has received a disturbing letter from a subscriber, Stella Rode who claims her husband, a teacher at the prestigous Carne public school, is going to kill her. She asks Smiley to take the letter to the local police after finding out that Stella has actually been killed. When I look back on my thirty years at Carne, I realise I have achieved rather less than a road sweeper... I used to regard a road sweeper as a person inferior to myself. Now, I rather doubt it. Something is dirty, he makes it clean, and the state of the world is advanced. But I-what have I done? Entrenched a ruling class which is distinguished by neither talent, culture, not wit; kept alive for one more generation the distinctions of a dead age. In order to solve the riddle, Smiley is the only one who can get into Carne. Not in a physical sense. But in a class sense. The local police know they can't find out what really happened because they're used to being met in the kitchen and offered a cup of tea. Smiley can meet the suspects on their own turf, in chapel, in their drawing rooms, at dinner parties and in the school itself. Like all of le Carré's books this is tightly written. Descriptions are sparse, and tensions high. While the outcome of the detection is satisfying enough, the real story is the rigid prejudices of the British ruling class and their school system. For this reason alone while it is a novel first published in 1962 it has much to say about 2017. 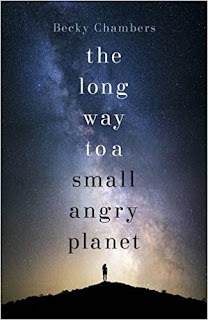 Various reviewers have described The Long Way to a Small Angry Planet as a "joy" or "delightful". It is certainly entertaining and inoffensive, but I was disappointed that the author didn't use her material to produce a more challenging story. Set on a dilapidated spacecraft called the Wayfarer the crew of which are tunnelers that drill the interplanetary routes that allow faster than light travel. At the start of the novel Rosemary Harper joins the crew as a lowly administrator. She has a past that she is trying to hide, something that is shared by most of the crew, like almost all science fiction set on dilapidated spacecraft. Through Rosemary's eyes we are introduced to the various species that inhabit the galaxy and the bureaucratic system that manages their societies. Becky Chambers uses the various aliens that crew the Wayfarer and the planets they visit to explore questions of gender, family and sexuality. These are fairly benign to be honest. Most of the individuals/groups they meet are relatively inoffensive and its only when the ship embarks on their real mission that the crew encounter real danger. Wider conflict and danger is hinted at, mostly through the interaction between the Wayfarers captain and his lover Pei, an alien who crews a ship that takes on more military engagements. At times the novel feels like Star Trek as each chapter gives the crew a minor problem to solve and allows one of the individuals stories to be told. It is all entertaining, well written and, as I said, inoffensive. Disappointingly, the encounters that the crew and its individuals have, both with the aliens they meet and among themselves, aren't used as deeply as they might have been. Rather than challenging contemporary ideas of family, sexuality and relationships, they end up with a rather tired trope that "family is those who we live and love". Its all a little disappointing given the potential to do something radical with the very alien groups that the author describes. The novel only really picks up speed in the very last section, and the final "twist" again allows Chambers to approach some deeper questions about what it is to be "intelligent" and "conscious". But again this is done relatively lightly and left me feeling a little disappointed. The Long Way to a Small Angry Planet has been very successful, making the difficult transition from self-publishing to mainstream press and the sequel is already out. I expect that it will do similarly well. If you like straightforward science fiction it is worth a read, but there are other places to go if you want something more meaty. Toussaint Louverture remains an inspirational figure to those who want to challenge oppression and exploitation. Perhaps only Che Guevara is a better known representation of anti-colonial revolution. Louverture was the leader of the Haitian Revolution, which overthrew French colonial slavery, fought off an English invasion trying to capture the colony and then, with the decline of the French Revolution, defeated a Napoleonic invasion intent on restoring slavery. Louverture played a crucial part, inspiring, leading and organising the masses in their military struggle, creating a social movement that could defeat their colonial oppressors and go further to declare independence. 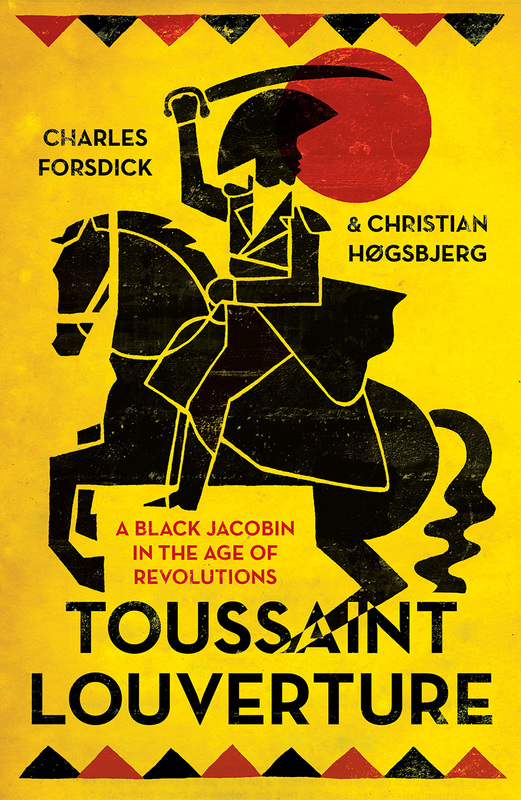 Forsdick and Høgsbjerg's new book should become an essential introduction to the life and politics of Louverture because it places his actions in the context of the wider Revolutionary era. It is accessible and will enable to the reader to get to grips with other classic works such as CLR James' Black Jacobins. 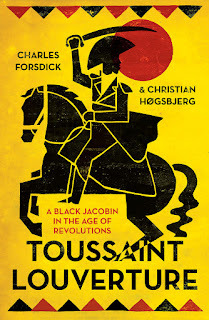 The authors note how the ideas of the French Revolution with its talk of liberty, fraternity and equality, went deep into the heart of the revolutionary movement. They gave inspiration, but it also meant that events on Haiti would have global implications. One executed insurgent was found to have 'in one of his pockets pamphlets printed in France, filled with commonplaces about the Rights of Man and the Sacred Revolution'. If the enslaved themselves had not risen up against slavery, in what constituted the largest slave revolt in modern history, then as Dubois notes, 'the French Revolution would have probably run its course, like the American Revolution, without destroying the massive violation of human rights at the heart of the nation's existence'. But as the authors explain, it was not enough for the enslaved masses to rise, they had to also take the revolution forward through numerous twists and turns, to win victory. This required revolutionary leadership, and Louverture was able to provide this. He was not alone and the tensions between him and other military and revolutionary commanders are neatly explained here. But there is no doubt that without Louverture the revolution would not have gone as far as it did. That said, this is no hagiography and Louverture was no perfect, flawless leader. Louverture did not play a role in the initial uprising, something he was keen to avoid discussing. But he was able, at crucial moments, to seize the time and drive the movement forward; inspiring and leading from the front in some of the most brutal conflict imaginable often against over-whelming enemies. The ill equipped and outnumbered black armies were able to defeat some of the best trained colonial troops that France and Britain could send. That they did so is testament to the desire of the masses to fight for liberty and freedom, and the leadership of Louverture and others. While the authors focus on Louverture, they never forget the role of thousands of ordinary people in winning their revolution. Let us go forth to plant the tree of liberty, breaking the chains of our brothers still held captive under the shameful yoke of slavery. 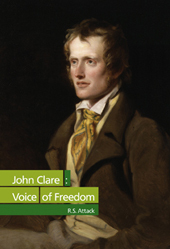 Let us bring them under the compass of our rights, the impresscriptible and inalienable rights of free men... We see only to bring to men the liberty that [God] has given them, and that other men have taken from them. But what was that liberty? In reality it meant the creation of capitalist relations in the former slave plantations. The revolution had led to economic collapse, and Louverture was able to turn this around relatively quickly, even bringing back former plantation slavers to oversee the new agriculture. But the slaves who had overthrown their masters did not take kindly to their new wage slavery and Louverture found himself crossing the country to put down strikes and riots against the new conditions. Capitalists constantly want to extract the maximum from their workers and the contradiction of the Haitian Revolution was that the class who had made the revolution now found themselves in new servitude. You can lay claim to the products of this land only through agriculture. And I have told you that the portion assigned to you in the revenues of the land will be given to you only in compensation for your work... Before, you had no share in the profits of the plantations. Today each of you will have his share in these profits in proportion to his work. Despite their central role in the Revolution women were given a secondary position, wages were unequal. Louverture was complicit in this "Work is necessary, it is a virtue. It is the general good of the state. Every lazy and errant man will be arrested to be punished by the law. But service is also conditional and will be paid a just wage." In other words Louverture led a movement to overthrow slavery, but it was not to build a world of freedom. That said, the revolution itself created a very different world. There's a fascinating quotation from a British officer who sees "the usual subordination's of society... entirely disregarded, and that he was to witness for the first time a real system of equality." The "Age of Revolution" that the masses of Saint Domingue were fighting in, was not one for freedom and true economic equality, it was to establish a new capitalist order. This is the contradiction that Louverture faced and one that, whether he liked it or not, he had to enforce at the risk of shattering the revolutionary unity that had overthrown slavery. This biography is an important one because it understands that the Haitian Revolution was not the work of an individual, nor was it isolated from wider political and economic developments. Its impact was enormous and the final chapter is a fascinating discussion of the lasting impact of Louverture and the Revolution. This is not a long book, but it contains a wealth of material and argument that everyone interested in the struggle for social justice will learn from. I highly recommend it. Its been quite a long time since I've read a novel quite this weird. And I mean weird in a good way. 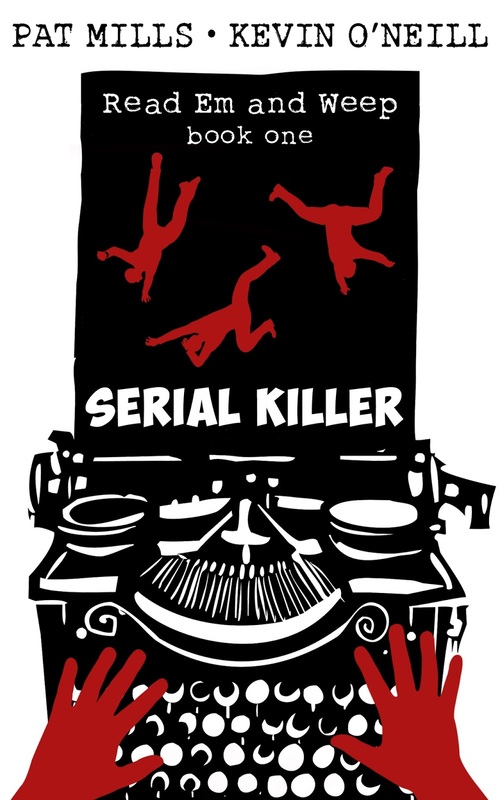 Crime fiction about serial killers can easily fall into cliche, instead Pat Mills and Kevin O'Neill's new novel Serial Killer creates a whole new set of cliches to be emulated by authors for years to come. Both authors have been at the heart of some of the most adventurous, challenging and fascinating graphic and comic writing of the British post-war period. Mills is well described as the "Godfather of British Comics" on the back of this book. O'Neill has played a similar central role in the graphics novel industry. So their first collaborative novel ought to be something special and it's certainly different. Given the background of the authors readers will not be surprised to find that the slightly alternative reality Britain that it is set in focuses on Dave Maudling, a comic book writer of some skill, whose work for a series of unsavoury publishing houses has given him a jaundiced view of the world. The off the wall titles he and his colleagues work on, such as the Caning Commando, The Spanker and Feral Meryl are all glorious spoofs of the sort of comic that abounded in the late 1970s. Mill himself was responsible for one of the greatest war comics of all time, Charley's War, but the spoofs here are of those second rate comics that saw every German as a Nazi and each Japanese soldier as a yellow-eyed maniac who'd run at the first sign of some British steel. Maudling's mother is murdered during his childhood. 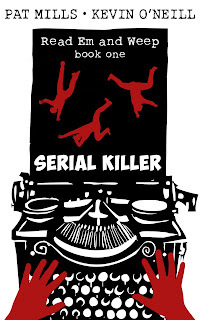 She then visits Dave in the 1970s and enlists his help in finding her killer. At the same time, Dave is also trying to become a killer himself. He enacts revenge on the world that has left him embittered and alone by trying to encourage children to kill each other by inserting dangerous ideas into the most popular comics. One of the clever things about this book is it shows how the casual violence, sexism, racism and homophobia of the post-war period helped shape a generation of men whose lives were causally violent, sexist, racist and homophobic. Dave's sexual obsession with fur, his bizarre home life and his inability to function properly around other people is the backdrop to what seems to be at least a temporary descent into madness. That said, everyone in the 1970s seems mad from this distance and the larger than life lunatics that inhabit Mill's and O'Neill's world only serve to highlight how far we have come, and how much further we have to go. One particular aspect to this is the way that the authors highlight precisely how bad workplace sexism and homophobia was before social movements helped make it quite so unacceptable. In fact those that cry today about political correctness might do well to reflect on precisely why it was the women's and gay liberation movements became so radical. Sadly Maudling has a lot to learn in this regard. It is difficult to review this book without giving away too much of the novel. If you love the comic genre, like a lot of knowing references to the 1960s and 1970s (not just to comics either), hated those terrible comics they made girls read about boarding schools and aren't phased by novels that mingle the living dead with sexually ambiguous characters, then this is definitely for you. At times it's laugh out loud funny, at others its quite perplexing. You'll either like it a lot, or never get past chapter two. 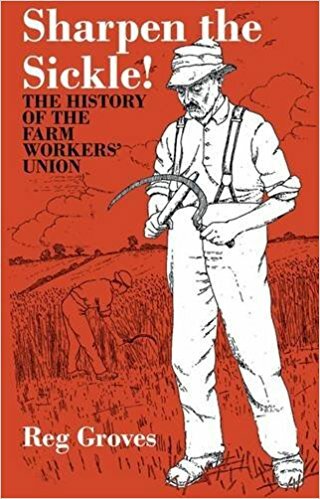 This lively account of the history of British agricultural trade unionism is written by one the UK left's most interesting characters. Reg Groves was a Communist who wrote briefly for the Daily Worker but ended up breaking with them and becoming influenced by Trotskyism. Eventually he became well known as a Christian socialist, remaining true to the socialist cause for his whole life he made links with Trotskyists from the new left in the 1970s. He wrote, or jointly authored, a number of popular histories of radical movements. I reviewed his book (jointly written with Philip Lindsay) on the Peasants' Revolt of 1381 previously on this blog. They are all aimed at a mass audience and are often entertaining reading. A note of caution though, Groves on occasion is a little lose his historical accuracy and books of his like Sharpen the Sickle! have no footnotes, so those reading them for research might want to have other sources to hand. Nonetheless Sharpen the Sickle! is a powerful read. 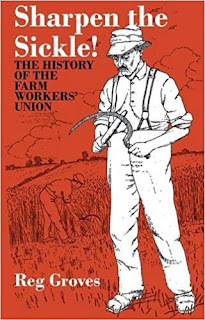 It begins with early attempts at trade unionism in the countryside, briefly touching on the Tolpuddle Martyrs before discussing the struggle by Joseph Arch to found and maintain a national union in the early 1870s. Groves is found of focusing on key individuals in the movement - reflecting a close connection with many of them. But the doesn't ignore the forgotten rank and file, and indeed, where possible he celebrates some of the smallest struggles in order to put rural trade unionism into context. The defeat of Arch's union in the mid 1870s, led to a difficult period economically and organisationally for the agricultural worker. The late 1890s saw a brief revival in fortunes, but it wasn't until the 20th century that trade unionism was back on the agenda. Once again it arose out of the absolute poverty of the countryside and despite the braking role of the liberal politicians that helped found the new unions, workers quickly moved into battle. In addition to the intransigence of the farmers, agricultural workers face a number of issues that make it harder to organise - seasonal and temporary labour; (at the time) tied cottages and so on. But Groves shows how the union was able to over come these and build a mass base. The 1920s brought economic decline and collapse in wages after the UK government abandoned its support for agricultural post World War One. But the workers fought back with a major strike in East Anglia in 1923 that helped to stem the losses. It seems that agricultural unions played little or no role in the General Strike that closely followed this, at least according to Groves' account. The 1930s were the "lean years" and the union fought a rearguard action through the Labour Party to try and gain better conditions for the workforce. Labour in the 1920 and 30s played a dirty role in betraying the hopes of its working class base, and agricultural workers suffered more than most. The final chapters then are Groves' account of the small gains they did make and the impact of World War Two. Interestingly, Groves' radical politics come out at the end when he comments on the limitations of agricultural trade unionism in the context of capitalist farming, echoing Marx's writings on the metabolic rift. But it would be wrong to leave the impression that the NUAW [National Union of Agricultural Workers] as a whole has yet expressed its final opinion on the future of Britain's agriculture. So far, it strives against capitalist agriculture only to get better conditions for its members, it seeks adjustment rather than drastic change. This, however, puts the NUAW in a halting place, a half-way house, untenable in modern conditions. Not only does this leave the status of the farm worker unchanged; it also leaves untouched the fundamental unsoundness of present-day agriculture. 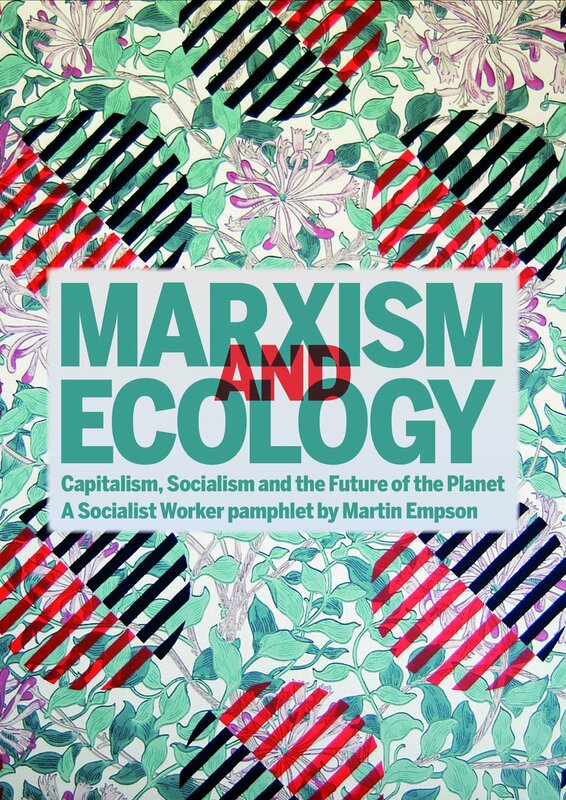 For capitalist industry and agriculture broke the essential social and individual relationship between man, his work and community life, and the land, which was the basis of the oldest subsistence farming. 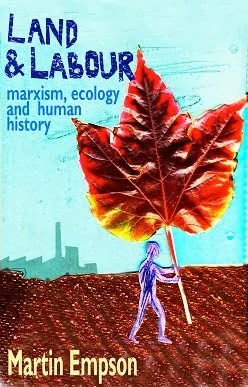 The freeing of land and labour from exploitation and destruction is only possible if it purposes to restore men's co-operative relationship with the soil. 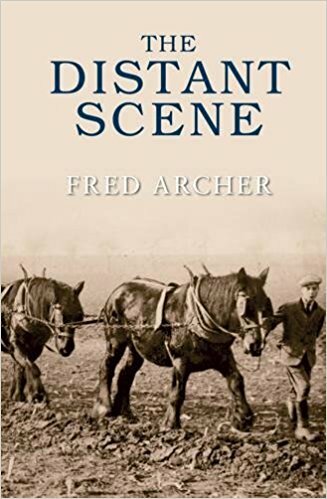 Fred Archer was a celebrated author and farmer who documented the lives of the people of the small village of Ashton in the Vale of Evesham. This, his first book, sparked a large number of others until his death in 1999. Born in 1916 the backdrop to Archers' life was the enormous changes that overtook the English countryside between the wars and in particular after World War Two. His books are somewhat whimsical - they deal mostly with the personalities of the village and how Archer remembers them. 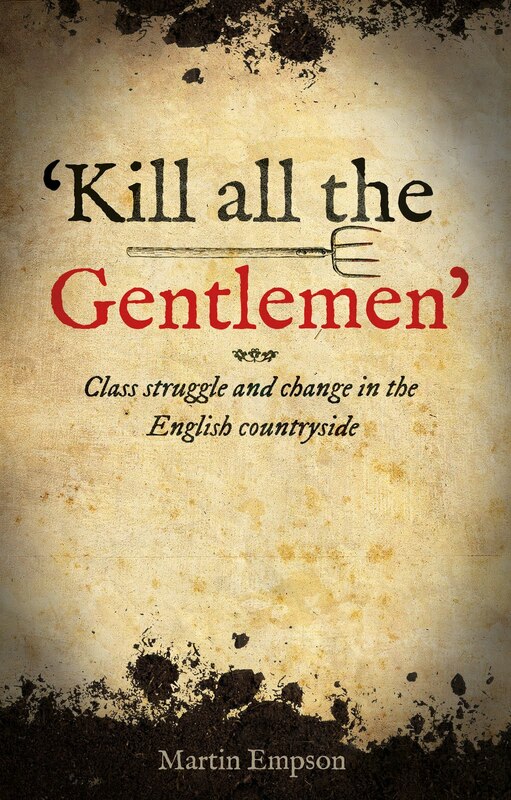 As such its easy to read the books as accounts of old-fashioned sayings, humour and advice; or to focus on Archers' complaints about the decline of rural skills, the replacement of horses by engines, and the wider social changes in the village. The danger is, of course, that the reader ends up romanticising of the countryside and the lives of those that live there. 20th century rural life was much better for the working population of the countryside. But it was still a life dominated by low pay and poverty. Reading between the lines of Archers' book you get a sense of a strict hierarchical life, and on occasion you get hints of the poverty behind the characters. Archer himself was a hardworking man who turned his hand to all of the agricultural labour there was. Readers looking for descriptions of how haymaking proceeded or the art of ploughing with horses, will find plenty of that here. There are the occasional hints of wider subjects. For instance, Archer recalls (probably in the late 1920s) older labourers reminiscing about the arrival of Joseph Arch to speak to them, from the back of a waggon, about the need for a trade union - this would likely have been between 1872 to 1875. These moments left a lasting impression on communities dominated by poverty and long hours of work. I was also struck by the chapter detailing the workers who came from Birmingham and other towns and cities to pick peas every year. These weren't itinerant labourers, though those did exist, but workers from the industrial towns whose "holiday" in the sun was a weak picking peas and drinking in the local pub. Archer himself was from a better off family, his dad working closely with Mr. Carter, the big farmer. In fact Archer refers on occasion to going away on holiday, which must have been remarkably unusual for the majority. 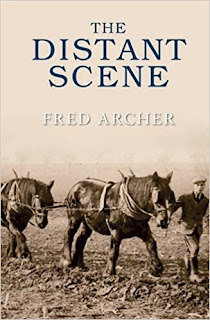 A Distant Scene then is worth reading, not just for its humour and carefully written descriptions. But also because it portrays a wider agricultural community in transition.